This isn’t a post about everything I ate in Singapore, only the ones that are part of their local fare. Exactly one year and two months ago, I visited Singapore and I had a whole itinerary planned for the three-day trip. However, a lot of things went awry and I barely managed to enjoy the place. When my client asked me a few months ago if I wanted to go to Singapore for a hotel and plane-paid meeting, I immediately said yes. My mom used that as an excuse to “chaperone” me and brought my sister along so she will have someone to show her around while I’m in my meetings. The whole trip felt like a whirlwind! On Friday night, the plan was to go taste some Indian food. To cut a long story short, we ended up in Bugis Street because my co-worker was going to shop, but all the others thought he was leading us towards an Indian restaurant. Karalyn and I used that as an excuse to shop for souvenirs for a while, while the client and Joel went to have a beer. When I arrived, he and Joel had about a mug each full to the brim with beer, and he asked me if I wanted to drink. I didn’t want to look like a killjoy, so I said, sure! 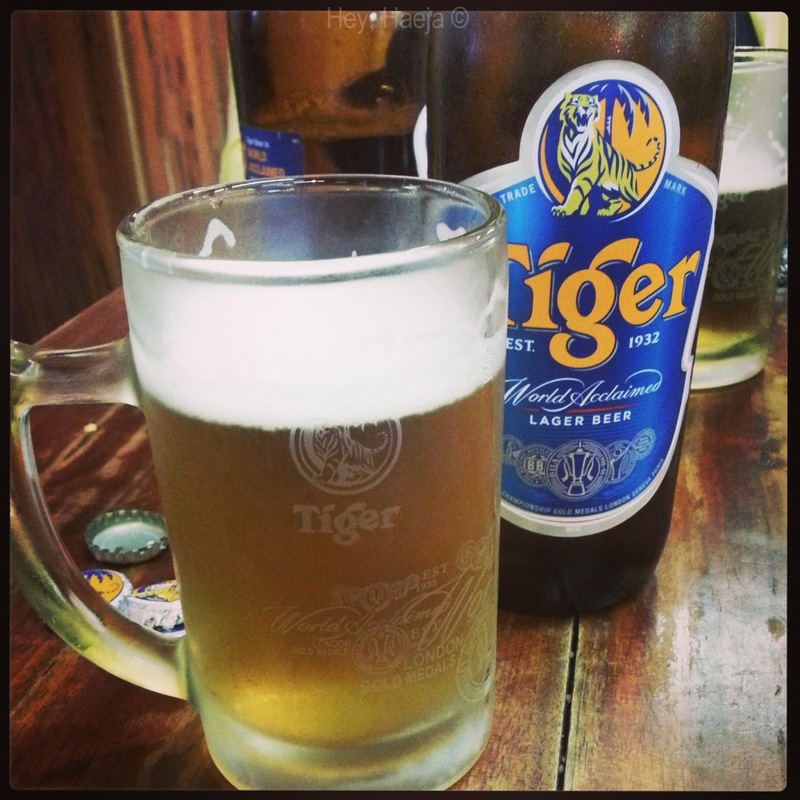 My first Tiger beer! This half-liter bottle cost S$7. I tried to make sure to not show the surprise on my face, and I managed to drink the whole half liter. On an empty stomach. Okay, I just like to state that for the record, I’m not much of a drinker and I only started drinking socially the past few months. And I forgot the very important lesson to never drink when you’re hungry! I think we were all a little inebriated because we kept laughing and giggling while talking. But I didn’t even realize I was tipsy until I started texting two of my friends that I’m laughing and I’m tipsy (one of them even wanted to screencapture our messages because it was the first time they “saw” me tipsy). Also, when I got up, well, I was walking in zig-zags and kept elbowing J to keep me from falling on my face. I was very lucid, swear. How do I know that? Because the client wanted to go find another restaurant, and since I had the map, I had to lead the way and I managed to get us from Bugis to Purvis Street. Which isn’t very far, I know, but when you’re a bit inebriated and starving, it would feel like such a long walk. Also, they didn’t ask me if I was drunk, so that’s a good sign, right? 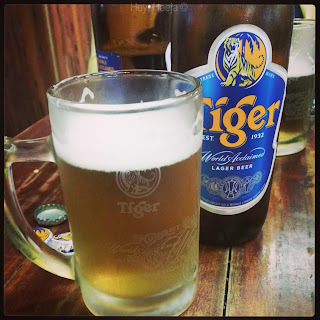 I was pleasantly surprised to find that I enjoyed the beer, and that it didn’t have a bitter aftertaste like the other local beers I have tasted. We went to Purvis Street for an Italian restaurant, but we decided to go to another restaurant instead where they served a mixture of several Asian cuisines (except Filipino, sadly). The food was good, but what I really enjoyed was the façade of the buildings. They were really different from the steel and mirror buildings around Singapore. 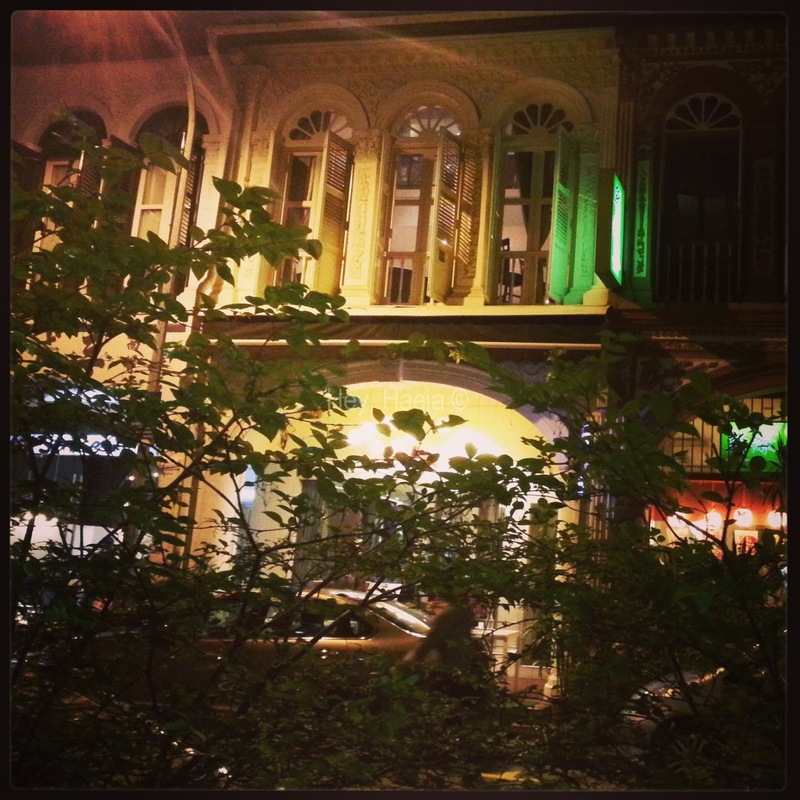 I think they’re colonial buildings that were restored/maintained and became the place to be for posh restaurants. 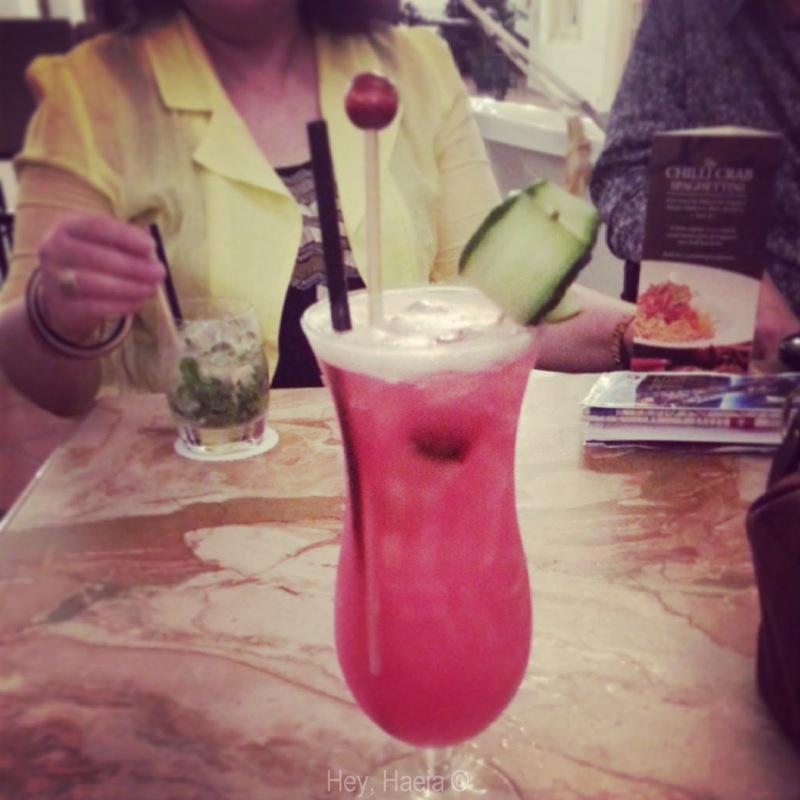 One of the things I promised myself that I will do is to have Singapore Sling at Raffles. So while I kept drinking socially for the past three months, the one cocktail I did not order was that. We were on our way from Bugis back to our hotel…or so I thought. We passed by Raffles and the client decided to go in, sit down, and let me order Singapore Sling. I was really shy because it was pretty expensive, but I thought, oh what the heck. I almost backed down because it was pink, and I don’t like pink drinks, but Karalyn was excited for me to order because she also wanted to see it. Well, they all wanted to see it so I went for it. By this time, I wasn’t very tipsy anymore anyway. It…was a little bitter. It is a mixture of so many ingredients but the end result was a sweet and mildly bitter drink that I drank in under an hour. It was surprisingly tasty, and I didn’t think I’d enjoy it because it was a pink drink. :)) I have a bias against pink drinks. I love pink stuff, but not pink drinks. Go figure. The next day, we met up with ate Mako’s friend, Maggie, and her boyfriend, Aaron. After patiently waiting for us to finish shopping (thank you, you are really so nice!! 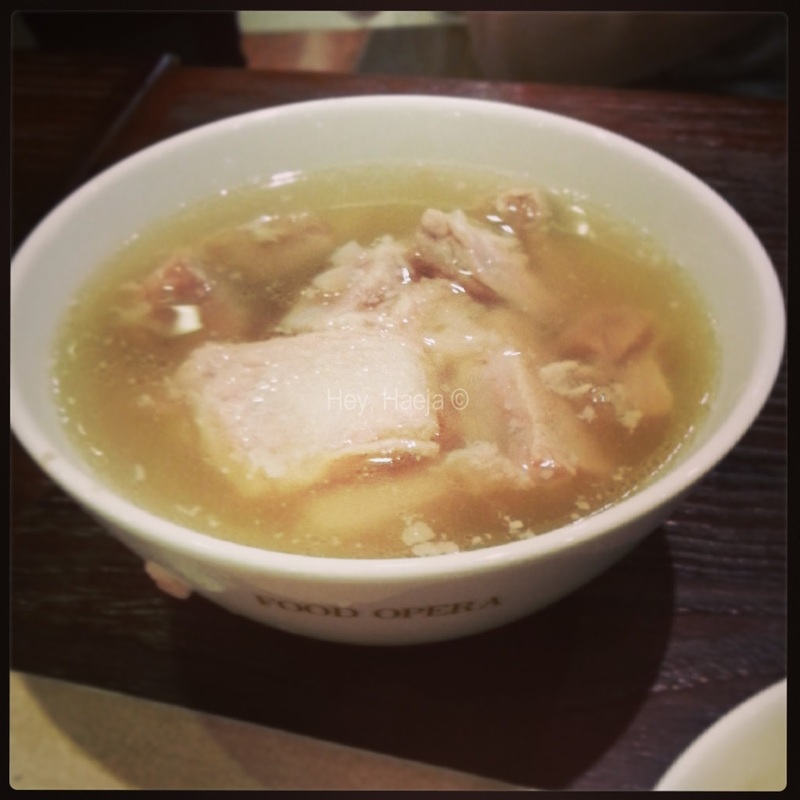 ), they brought us to Ion Orchard’s food court, and treated us to Bak Kut Teh, which is just pork ribs in…soup? It reminded me of the Filipino dish nilagang baboy, but the Filipino version is tastier. I found it too bland, I had to ask for soy sauce to add a bit of taste. I didn’t really drink or pour the soup of the Bak Kut Teh because, well, it looked oily. The one part I did enjoy about the dish is that the pork was really tender. The next day at Changi Airport, I was trying to find Hainanese Chicken Rice but I couldn’t find one and we ended up in Burger King instead. So the whole trip we were there, we didn’t get to try Hainanese! Foiled. The one time I found a stall that Friday, but it wasn’t open so I opted for Japanese food.